If we put a pencil and some paper into a room and let them remain in the same place for a thousand years, do you think it would be possible for the single letter of “A” to come into existence on the paper? Or if we put a piece of wood, some nails and a hammer and again let them remain there for a thousand years, do you think it would be possible for a table to form on its own in that thousand years? Or if we put some paint with a canvas together in a room and let them remain there for a thousand or even ten thousand years, would it be possible for a picture to come into existence on its own? Or let us ask it this way: Can anyone convince you that the single letter of “A”, a table or a picture can come into existence by mere coincidence? In other words, suppose that they said: this letter of “A” has come into existence by the coincidental move of a pencil. And this artful table has come into existence by the coming together of the pieces of wood and the hammering of nails by themselves. And also this wonderful picture has been formed by the falling of paint on the canvas due to the blowing of wind. Can they convince you? Of course not, because, coincidence cannot be claimed to be the artist or the craftsman of a work by any means. Actually, a created work of art requires the existence of someone who created it and a craftsman who prefers its existence to its absence. It is impossible for a work to exist without a craftsman. Yes, a letter cannot exist without an author; a table cannot exist without a craftsman and a painting cannot exist without an artist. Similarly, beings created before our eyes resemble the letter “A”. Each of them from a bird to a flower, from a butterfly to a tree, from fish to a bee resembles the letter “A”. And maybe, they do not resemble “A” but a book. As even a single letter of “A” needs a creator in order to come into existence and as it cannot exist on its own, it is, of course, impossible for all the innumerable beings in the universe to exist on their own. Just as a single letter of “A” proves the existence of its writer and shouts out with its own existence the existence of the writer, so too do innumerable beings each of which resemble a book prove the existence of their writer, who is God, and they indicate God’s existence with their own existence. Now, how can one, who agrees that a letter cannot exist without its writer, that a painting cannot exist without its artist and that an act cannot exist without its doer, conclude that this book of the universe exists without its author, that the lively scenes in it are without their owner and that all these acts occurring in the universe are without their doer? 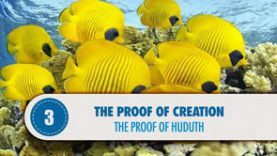 We can also use the proof of Huduth by showing that the universe was created out of nothing. Just as in the example of letter “A”, the universe did not exist once upon a time and it was created later. As everything created later needs a creator, so the universe must have a creator, too. He is the Creator, who preferred the existence of the universe to its absence and brought this universe out to the world of existence from the darkness of absence.